As we know, skating is a perennial pleaser, as we can see by the popularity of figure skating and hockey. 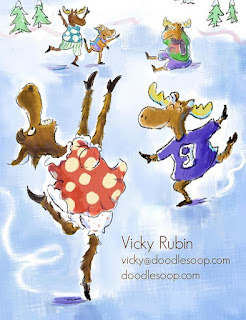 Moose are hot right now in picture books. As well, children are being allowed to break away from proscribed gender roles. MOOSECAPES! is a joyful romp around the pond starring Max, a moose who wants to skate. His family tells him "moose don't skate" and "boys don't skate." But he proves them wrong in this exhilarating text. My animal poetry has appeared in CRICKET and SPIDER and been selected as part of a school curriculum. I have included the first approximately 50 words and one art sample. Max goggled in wonder as skaters whizzed by. “People can ice skate, so why shouldn’t I? The breeze in my antlers is just what I need. “I’m going to skate,” he announced to the herd. I am interested in seeing more of this as well as the art samples. Please submit the manuscript, query, and any further samples to cedarfort.submittable.com/submit. Sounds lovely! Please send query + ms + art samples to Clelia@martinliterarymanagement.com with #pbparty in the subject line. Thanks!